If you go to the 'Portable Antiquities Scheme' web site, linked by the History Centre, and pull up page 46 of Island finds images, you will see a series of pictures showing recently discovered Roman potsherds. Given the considerable range and quantity from a single location, it is difficult to escape the conclusion they represent a previously unknown site of Roman occupation. Yet, in spite of the evidence, there is no official recognition of this important discovery. This bizarre situation arises largely because many archaeological finds are now discovered and coveted by the private collector. In most cases finders, landowners and archaeology departments all have their reasons for not publicising the discovery. Our Roman pottery is merely given the general location of Shalfleet Parish. Finders are mainly metal detectorists. Outside of legally classified 'treasure' they are not obliged to report finds. The Portable Antiquities Scheme was established to encourage metal detectorists to bring finds to local archaeology centres, including non-metallic items. They get the benefit of a proper validation service while archaeologists can record the finds before returning them. Most metal detectorists have responded well to the scheme and on the Island there are two established groups which liaise with the IW Archaeology Unit. Find locations are mainly withheld to thwart 'rogue' treasure seekers but this fear is exaggerated locally. There are plenty of well known historic and prehistoric sites on the Island with little evidence they are plundered by 'nighthawkers'. Without the enthusiasm of metal detectorists we would not have the discoveries and the web site enables the public to view them. Most finds do not have wider site implications but some, like the Roman sherds, cry out for a published archaeological interpretation. The archaeologists, the landowner and the finders have the information but the rest of us are in the dark. The long term future of the scheme is uncertain. As the enthusiasm for metal detecting grows the burden placed on already stretched archaeology services could become unsustainable. The scheme's lottery funding will end at some point and a review may give voice to those who feel developments have rendered archaeological discovery akin to stamp collecting. Local history has probably been subjected to more research on the Island than in most counties, and John Speed's map of 1611 must rank as one of our most familiar historical documents. We therefore assumed the map has nothing new to reveal. 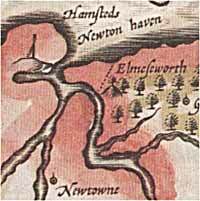 That is until somebody queried the small dotted line drawn at Elmsworth, on the outer reaches of Newtown Harbour. It seems nobody knows what the line represents, perhaps because the question has never been addressed. Suddenly we have an intriguing mystery. John Speed is England's most famous cartographer. His maps of the British Isles were published early in the 17th century. He typically employed the dotted line to identify district boundaries and on most maps he makes extensive use of the feature. Yet on his Island map he uses the dotted in just one place, at Elmsworth. Why does he regard this obscure spot as being the only division of land requiring that method of identification? Coincidentally the line follows the course of a 'boundary' ditch which exists today. There is no evidence the ditch existed when Speed drew his map but, even if it did, boundary ditches would have been common at the time and of no particular significance. The area to the west of the line may have had housing and salterns in the 17th century but, again, nothing that might be considered unique. In spite of his prolific mapping, Speed was first and foremost a historian. He always considered his published History of Great Britain to be his main project. Accordingly the maps are not just a cartographic exercise but reflect his knowledge of the past. Perhaps John Speed knew something about Elmsworth which we have yet to rediscover. Recent Grade II listing of the historic crane has come as something of a relief to many locals who feared the closure of Souter Marine would signal its dismantling. The news is not, in itself, an absolute guarantee of long term protection but it does create the basis on which the council and other interested parties can formulate a policy for its future preservation. The crane was ordered by J S White in 1911 and came into use the following year. It is one of the world's earliest examples of its type. Locally it represents the enterprise and skills generated by our most prestigious shipbuilder at the peak of over 300 years of Cowes shipbuilding. The future of the crane became an issue in 2002 when plans to develop the site threatened its existence. Calls to support statutory protection were unresolved at a meeting of Cowes Town Council and, lacking a thatched roof, the crane failed to endear itself to the then IW Conservation Officer. Subsequently more enlightened views prevailed and local research was processed through to the authorities for consideration. The Grade II listing refers to a working crane. The question of long term preservation will arise when it ceases to be operational, either through mechanical decline or renewed plans for development of the site. Much will now depend on whether Island planners can arrive at a clearly defined policy towards the crane in advance of changing circumstances. Maybe it would serve as an ideal landmark for a new and expanded maritime museum. Giant cantilever cranes dominate the skyline of many shipyards throughout the world. As waterside development begins to replace the old industries there has been an increasing awareness of their importance as a symbol of shipbuilding origins. Preservation attempts are active as far afield as Australia and America. The illustration at left shows part of the planned regeneration on Clydeside where the council have dictated that the developer must preserve the crane as an integral part of the scheme.